Now Some Flowers Are Blooming! The last of the crocuses are blooming now at May Dreams Gardens, with some tulips trying to edge them out and take over the space they've claimed in this garden. Soon, too soon, the crocuses will be a memory and the daffodils and tulips will reign in the garden. Someone told me that March would have wings and fly by and she was right! While I've noted before that this spring is taking its sweet time, suddenly, as I prepare to leave the garden for a few days, blooms seem to be popping up all over the place. 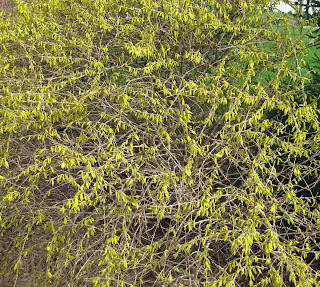 The forsythia is dripping with bright yellow buds and will likely be in full bloom by the end of the weekend, if it doesn't drown in the predicted rains today. This particular forsythia is the dwarf 'Gold Tide', and at least in my garden, on the southside of the house, it is spectacular in the spring. 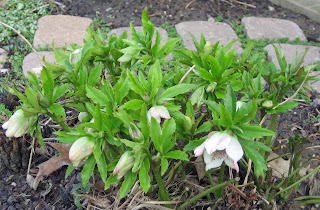 The hellebores are also starting to bloom, though as usual, the "shy" flowers face down and are difficult to take good pictures of. 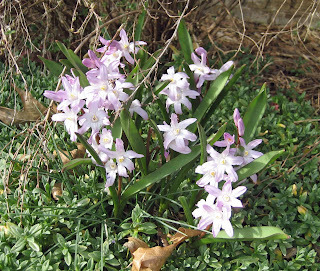 Chionodoxa, Glory of the Snow, is also in full bloom. The smaller leaves of the groundcover plants around them belong to Snow-in-Summer (Cerastium tomentosum)which will bloom in May once these fleeting spring flowers are long gone. 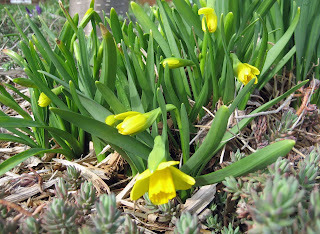 And nearby are some miniature daffodils. These are only six inches tall, perfect for the garden fairies to play around. 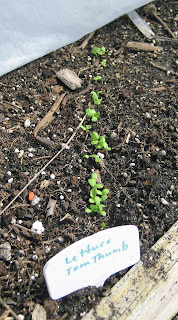 Out in the vegetable garden, all the seeds I sowed in the vegetable garden on March 16th are germinating under row cover, safe, I hope, from the rabbits. It's time to sow some more seeds to keep the harvest going later this spring and I might do that this morning before I leave for a long weekend. It’s no big secret that I am stepping out of my garden clogs and leaving my garden for a few days to go to the Garden Bloggers’ Spring Fling in Austin, Texas. Like many other garden bloggers, I am leaving the virtual world of blogs, pictures, and emails and entering the real world of gardeners, gardens and actual face to face conversations. I am not planning to post on my blog while I am there. I don’t want to be the gardening equivalent of one of those ‘scrapbooking moms’ who get so caught up in making great scrapbook pages that they dress their kids in clothes that will match the scrapbook paper they bought and then take them to events primarily for the photo op. Life shouldn’t be about just dressing up and posing for pictures! Nor should visiting gardens and gardeners be about coming up with pictures and words for a blog. So for a few days, I’m just going to be a gardener, visiting with other gardeners, enjoying gardens and plants and garden talk. I will offer a few tweets on occasion as time permits and return to blogging later next week. Carol, I was just outside getting the paper and was thinking how I will be missing the opening of many of the tulips while gone. But thanks for the jerk back to reality, going to see, meet and talk to gardeners will be the best. But I can't not take tons of photos, unless my camera breaks! Let's all dress up to match for the group shot! HA! It is getting harder to still my heartbeat as the time approaches, must be calmmmmmm. Frances, I'll be taking a lot of pictures, too. Matching outfits? Who has the scrapbook paper we need to match with? Funnny! I will miss you while you are gone but the anticipation of seeing all the picutres and hearing the stories about the gardens and better yet the gardeners will be worth the wait. 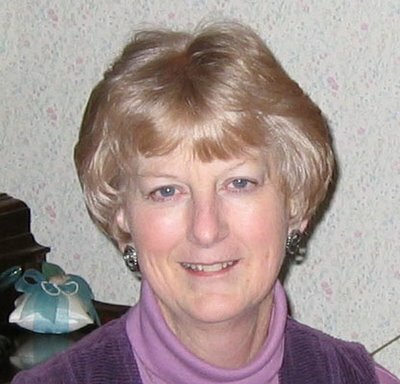 Have a great time while you are away Carol. You will have so much to look forward to when you return. 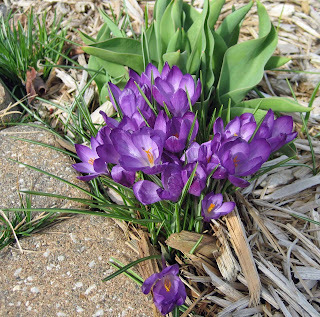 Your garden will be awakening after the rains and the weather should be warmer. You know how fast spring can move along once it gets started. Bon voyage. Have fun in Austin, Carol! While I love reading everyone's blogs, no photo can compare with seeing the real thing. I wish I were going to be there, too! Have lots of fun, Carol, and we want a report when you return! How nice to see so many blooms in your garden Carol. I still remember the bleak weeks when nothing was in flower and your jumping for joy when the first Crocuses appeared. Have tons of fun at the Spring Fling, wish I could come too. Have a good time Carol! You should be boarding the plane as I type. You guys have to get at least ONE group shot and someone post it for all of us back at home wherever that may be. You have so much blooming already. It's like you are in a different zone than me. I wish I was going to be there too. I hope you all have a wonderful time. I hope you all have a wonderful time, and I'll look forward to hearing about all the fun! Carol, not to worry. The rains and the cool temps that are expected for here will keep your garden from moving along too fast. Have a great time and maybe send us a 'wish you were here' line. nice blooms and i hope you have fun at that garden event in Austin! Hope your having fun there Carol. Sounds like a great time. I hope you think of poor little ole' me working outside whilst you are having fun in Austin :) We're having Spring openhouse at the Garden Center this weekend -and the famous Hellebores Festival. I know you're going to enjoy your Spring Fling. We can't wait to hear the full report. Your flowers are sure making up for lost time. Think what you'll be missing when you're at Spring Fling. On the other hand you'll see many things you can't grow in the north. Have fun! Nice spring you have going! Travel safe and enjoy Spring Fling! Wish I could go, but the oil barons have all my cash due to my long commute to work. ;0( Have a great time! Your flowers are jumping for joy! They look so happy! Have a wonderful time with the Spring Flingers and soak up some of that sunshine and warmth for us please! Carol...there's an award for you over at Growing a Garden in Davis..